So we popped the shelves into the space between fridge and the window, ostensibly to hold our shoes. The back door opens straight into the kitchen. We take our shoes off at the door and then, when they’re dry, we put them on the shelves. Tidy. But, since that space is also next to the basement stairs, the shelves tend to collect tools that need to be put back but that we’re too lazy to return in the moment. And then, over time, we add in the things that we want to donate to the thrift store and stuff that we don’t know what else to do with because we’re just too tired or stressed or distracted to make a decision. It’s perhaps the hardest-working piece of furniture in the house. And, especially this past year, has kept the rest of the place tidier and more serene than I could have hoped for, given that Alan’s working about 80 hours a week at the bakery and I’ve been mostly unable to keep up on the housework. We’ve been able to invite friends round for dinner because I’ve been able to swoop through the house and put things on the shelves there to be thought about later. And I know our friends would have still come over had those things not had a hiding place, but I would have been less relaxed, less inclined to issue the invitations. I’m still insecure that way. I started cleaning it the other day and realized that we have, actually, stumbled on to a great tool for the minimalist-minded. Because it’s impossible to maintain pristine surroundings while actually living a life, you need a way to deal with the mess. Cleaning as you go is great. As is stopping the inflow of unnecessary stuff. But there are times when you’re just too tired to return everything to where it ought to be and forcing yourself is cruel and sleep is important. And what is necessary today may no longer be needed next month and you can’t always donate it the instant it stops being needed. You need a place for these things to rest. It’s good if the resting spot isn’t enclosed. The front hall closet nightmare happens because you can close the door on it and the only time you remember the stuff is there is five minutes before the company shows up and you realize you will once again be throwing the coats on the bed. If you can see it, but just out of the corner of your eye every time you walk into the kitchen, you’ll be able to tidy up when you have the time and energy but it won’t drag you down when you don’t. I recommend against putting your Cabinet of Indecision in your bedroom. Your bedroom should be for relaxing, not stressing and feeling bad about yourself. And limit the space that you can use for your indecisions. Open shelving is good for that. You can only stuff it so full before things start falling off. You are also more likely to deal with the stuff that needs dealing with more quickly if it’s in view. And you do want to move through it sooner rather than later. You don’t want that energy of indecision to solidify. An entire set of shelves is more than I want to use for this purpose, now that life is running more smoothly. So as I tidy my Cabinet of Indecision, I will rein it in to a single shelf and use the other shelves for their original purposes – the storing of shoes and some kitchen equipment. What do you think? Do you have a specific spot for the things you don’t know what to do with? Can you keep it to that spot or does it tend to take over? Since completing our KonMari marathon we’ve got most ‘clutter’ under control but I do love your idea that if one requires a holding space for incoming / outgoing / dithering things then open shelves mean it remains manageable. 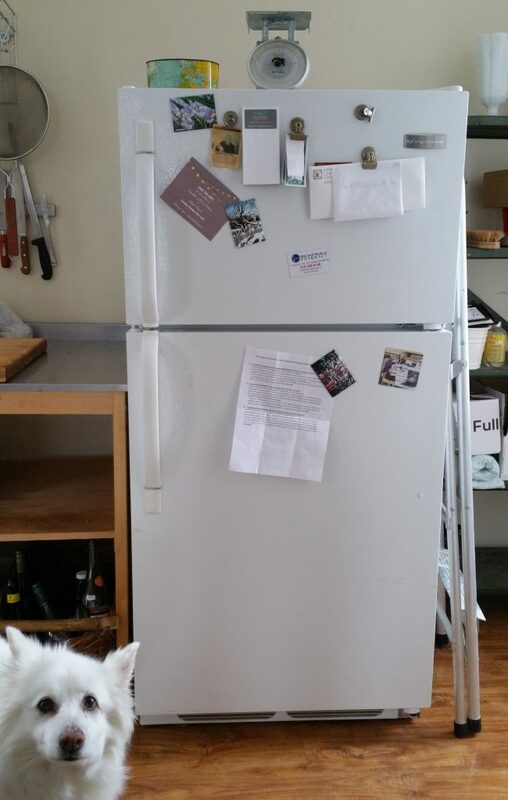 Always happy to see a picture of Ruffles…or your fridge! A Cabinet? Heavens…there is a box in the dressing room that gathers any clothing for the thrift shop…and a twin in the laundry room….and the stair shaped basket that gathers to overflowing befoe anyone thinks to take the contents to the basement, and baskets on the shoe shelf in the back entry,..you know…the ones with gloves and mits and shopping bags…oh…and seed packets from last year….! But what treasures one finds sometimes when you do get around to being decisive. Small, manageable bits are the way to go, Mary Ann. And the treasure hunting is fun. This house came with what I refer to as a ‘mud’ room. It is unheated and runs between the kitchen and the back door. In it, I place anything whose presence in the house lends itself to decreasing the harmony of the space – translated – clutter. Some of these items find ‘new’ homes quickly, but, those that don’t just ‘chill’ until needed. . . in the meantime, out of sight, out of mind. Good idea, Martha. Harmony is important.